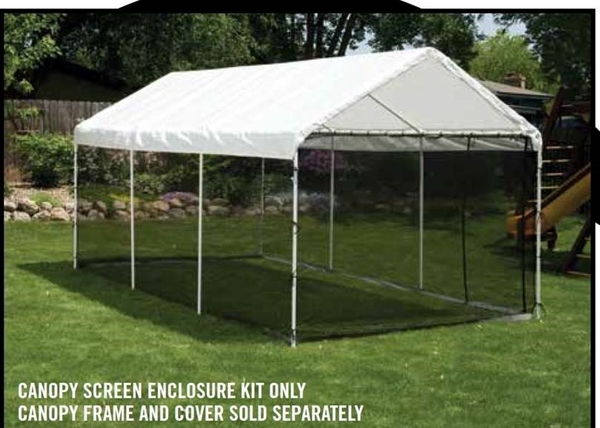 Making your canopy shelter into a fully screened in room easy with this screen kit. This screen kit, made by Shelter Logic, is designed to be used with the Shelter Logic 10 foot by 20 foot canopy. It does take much to make your canopy far more usable and pleasant. It can remain open to the outside air and breezes while keeping out the insects that can ruin an event or a family get together. The description is "four poly screened walls and two zippered front doors." How long are each of the four walls, and what size are the two zippered front doors? Are the latter 10 x 7 or 8 with eaves and zippered doors - like the ends of the regular 10 x 10 or 10 x 20 tents, or are they side doors like the Black Screen tent? The two ends (with zippers) have eave sections to completely enclose the canopy when the top is in place. This kit is designed for existing Shelter Logic 10x20 canopies with either 1-3/8" or 2" frames. Happy with the screen kit. Fits well on the canopy and plan to use it this weekend for a party including 15 family and friends. The screen works very well. Very nice screen, but is all one piece making it hard to put up especially if it is twisted. Once up works great. ProsScreens are black for privacy. ConsIt's one piece, hard to put up if twisted and it goes on outside of tent legs, so put it on before you stake!